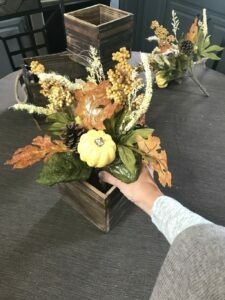 I absolutely love decorating for fall and one of my first things I set out is a beautiful but simple autumn centerpiece. I think the house just feels more inviting and warm when there are hints of fall around us. 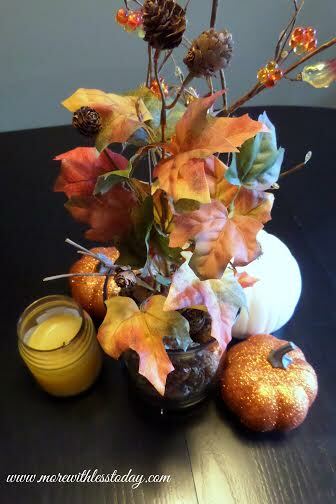 This autumn centerpiece is easy and affordable to put together and it will look great on your fall table. I have seen autumn decor like this is gift shops and specialty stores with big price tags. You can easily make these for just a few dollars. I found all the supplies I needed at Michael’s. You can buy it online, (I’ve included links for you) and put it together in just a few minutes. 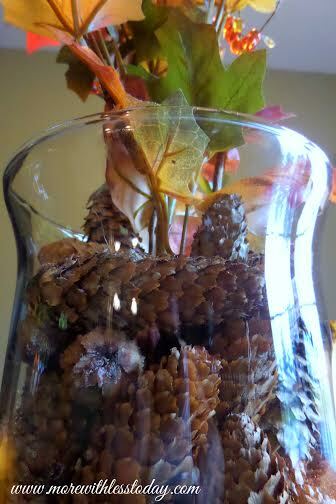 Fill your glass vase or hurricane with the pine cones. I found my pine cones in my yard but most craft stores sell bags of pine cones for decorating. These pine cones have a more papery texture and are long and skinny. I just love the look! For the fall foliage, I chose stems with pinecones attached. Look for a mix of tall stems and shorter bushier sprigs. Stand the stems of foliage and berries in the vase, using the pine cones to conceal the stems. The pine cones will also keep the stems standing upright. 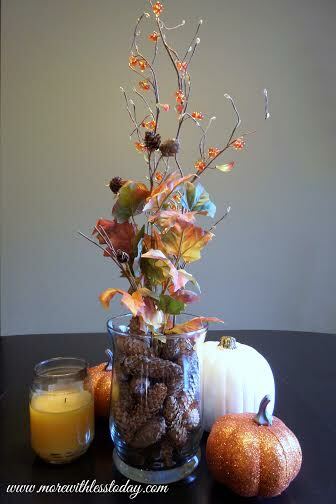 Display the centerpiece on your table with candles of varying sizes in shades of fall colors. Add artificial pumpkins to the display as well. Instead of going with a traditional vase, I found some amazing little wooden boxes at Michael’s recently. They call them Pallet Wood Bins and I found two different sizes. They were so inexpensive plus I know I can use them for different crafts during the year. 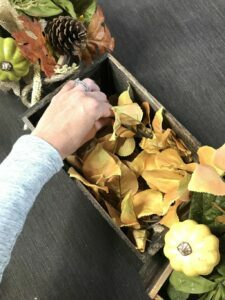 Also at Michael’s, they had ready-made bundles of fall florals which included pine cones, some burlap leaves, pumpkins, and gourds. To start, I simply placed one fall bundle in each small wooden box. 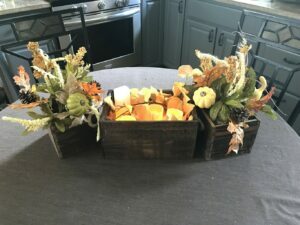 You can choose to fill in the empty space of the boxes with crinkle paper, pine cones or more fall leaves if you wish but I was satisfied with just the bundles. Next, I bent and manipulated one bush of golden fall leaves that I also purchased at Michael’s and placed it in my larger box. To give a final glowing touch, I purchased remote controlled battery powered pillar candles and placed them in the box of golden leaves. In the evening, you can turn them on with just a click of the remote and they add a nice, warm glow without worrying about lit candles. I’m loving these battery-operated remote controlled candles. I found them at Amazon.com. I love the glow of candlelight but always worry about having them around kids and pets. 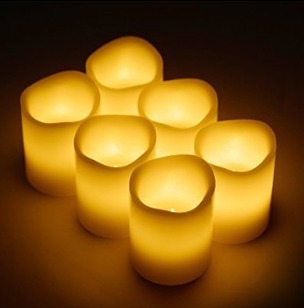 These remote controlled battery operated candles can be used all over the house, both indoors and outdoors. 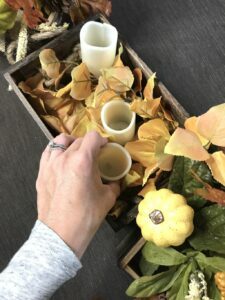 Fall has always been my favorite time of year and this beautiful, simple tablescape just goes to show one of the many reasons why I love it so much! The colors, the warmth, the glow all add to the cozy feeling I experience during this season as well as when I am able to have friends and loved ones over for a nice meal. Are you using Pinterest? Follow me and I would love to follow your “pins”!